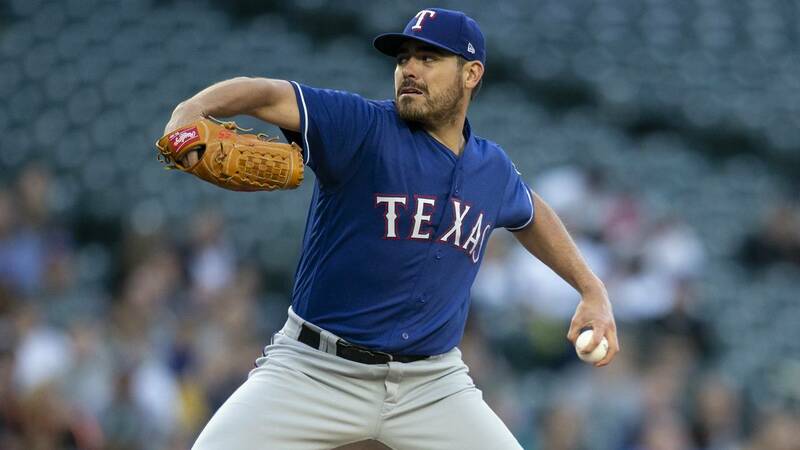 DETROIT - The Detroit Tigers have agreed to a one-year deal with left-handed starting pitcher Matt Moore. Moore, 29, began his career with the Tampa Bay Rays, starting 94 games from 2011-2016. He was an all-star in 2013 when he went 17-4 with 143 strikeouts in 150.1 innings. In eight seasons, Moore has struck out about 8.1 batters per nine innings with a 1.41 WHIP and 4.56 ERA. Last season with the Texas Rangers, Moore allowed 77 earned runs in 102 innings while striking out just 86 batters and posting a 1.66 WHIP. It was by far his worst MLB season. The Tigers are hoping to recapture the talent that once made Moore the No. 3 prospect in all of baseball, behind future star outfielders Mike Trout and Bryce Harper. He absolutely dominated the minor leagues, striking out more than a batter per inning with a WHIP under 1.00 and opponent batting average under .190. The young lefty was expected to have an excellent 2014 after finishing ninth in Cy Young voting in 2013, but his season was cut short by injury after two appearances. He only made 12 starts in 2015 and hasn't been the same since. The Rays traded Moore to the San Francisco Giants midway through 2016, and he struggled. The 2018 season was his first with the Rangers. "Matt is a veteran left-handed starting pitcher with a solid three-pitch mix that we see competing for a spot in our rotation next season,” Tigers General Manager Al Avila said. "He has the ability to effectively use the whole strike zone with his arsenal, and we’re excited for him to join our organization." Before the 2018 season, the Tigers made two under-the-radar starting pitcher signings: Mike Fiers and Francisco Liriano. Avila flipped Fiers midway through the season for a pair of prospects: right-handed pitchers Logan Shore and Nolan Blackwood. Shore is the Tigers' No. 17 overall prospect. Blackwood is a sidearm relief pitcher. Liriano got off to a fast start for the Tigers, but they weren't able to trade him and capitalize on his value. With the signing of Moore, the Tigers have 38 players on the 40-man roster.